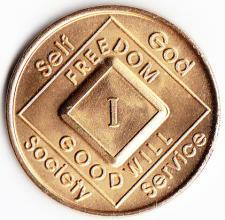 This bronze medallion is designed with the year of the corresponding birthday and the diamond shape with the words SELF, GOD, SOCIETY, and SERVICE around it. The back has the NA symbol in the center, circled by the phrases "THAT NO ADDICT SEEKING RECOVERY NEED EVER DIE," and "MY GRATITUDE SPEAKS... WHEN I CARE AND WHEN I SHARE WITH OTHERS THE NA WAY"